I did a little experiment this evening with an old stand-by...Tuna Patties! 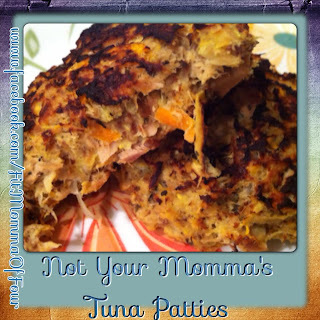 I really wanted to amp-up the flavor & find a way to make my tuna patties super-healthy. I pulled out my new favorite kitchen appliance & got to work. Here is what I came up with! * drain extra liquid after shredding veggies to avoid your mixture being too wet! Combine well & form into patties. Place on a lightly sprayed cookie sheet & broil for approx. 5 mins., turn & broil an additional 5 mins.